How can Britain double its exports by 2020 and bring manufacturing home? 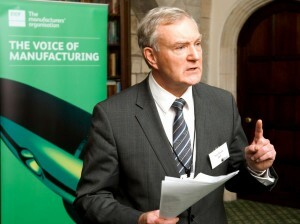 EEF, the manufacturer’s organisation, will seek answers at its third National Manufacturing Conference – ‘Make it Britain’ – on Tuesday 4 March 2014 at the QE2 Centre, Westminster. Senior industrialists and politicians will question how to turn the current reshoring trickle into a torrent that re-builds thriving supply chains, and how to meet the Chancellor’s target doubling of exports – to £1 trillion – over the next six years. Keynote speakers at the conference, sponsored by asset finance provider Lombard, include Secretary of State for Business Rt Hon Dr Vince Cable MP and Chief Executive of GKN plc, Nigel Stein. They will be joined by some of the UK’s most successful manufacturing exporters, including: Angus Thirwell, CEO and Co-founder of Hotel Chocolat; Tony Caldeira, CEO of Caldeira Group, and Sarah Brown, Managing Director of PAI Skincare. Panelists will also include Chris Sullivan, Chief Executive of RBS Corporate Banking Division, and Crispin Simon, Managing Director of Trade for UKTI, who will outline the help that’s available from government to break into overseas markets and re-shore operations. The conference, which will be chaired by broadcaster Emily Maitlis, will coincide with the publication of a major EEF research report into reshoring. The study will examine the growing trend for companies to bring production back to the UK, the drivers behind it, and the contribution this can make to our economy. Shadow Business Secretary Chuka Umunna MP will be guest speaker at the Conference Dinner, together with political commentator Matthew Paris.